Dividing the north of England from Scotland, Hadrian’s Wall stood as a line of defence against the Scot – or the Barbarians as they were known at the time during the Roman occupation of England. The wall later served as a customs post to allow the levy of taxes on trade over the borders. Today, it is the most popular tourist attraction in the north of England, and with good reason. Registered as a UNESCO World Heritage Site in 1987, in was later included as part of the trans-national “Frontiers of the Roman Empire” collection of World Heritage Sites along with other fortifications across Germany. The Wall has over its years attracted innumerable walkers who have tackled parts of its length or the challenge of following it from end to end. 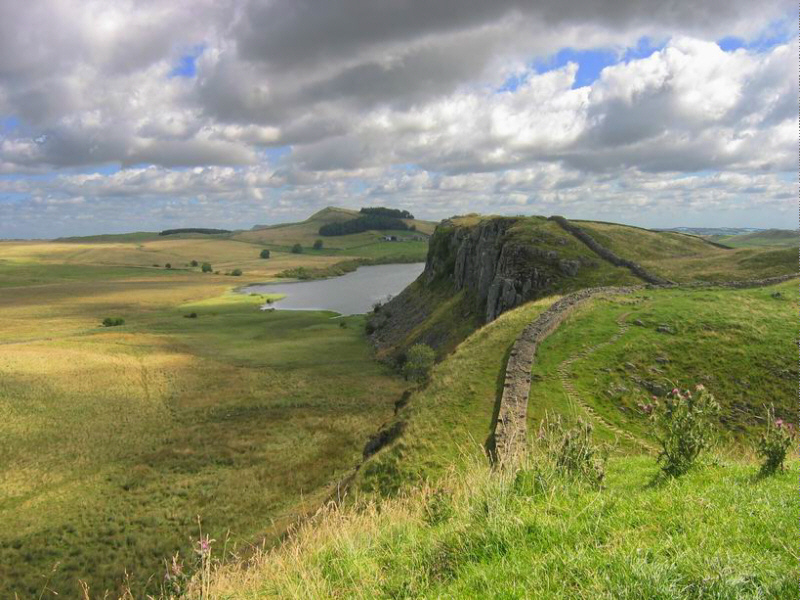 Measuring a grand 135 kilometres from end to end, the Hadrian’s Wall Path takes in some of the most beautiful scenery that the English countryside has to offer. Starting at Wallsend near the Swan Hunter shipyard, the first part of the path runs through urban and industrial areas of Tyne and Wear. However, by the time you reach Heddon-on-the-Wall, some 20 kilometres or so later, you’re in rolling open countryside. The sections through Cumbria and Northumberland take in some of the most spectacular countryside scenery that the UK has to offer. Hadrian’s wall in the area between Housesteads and Once Brewed. Although the Wall itself is not always visible along the path, it makes a re-appearance at regular intervals along the trail. In several places where the wall is most prominent, extensive renovation and conservation work has been carried out to ensure the wall is preserved for future generations. Along the length of the path, you will find several Roman forts in varying states of repair. The most interesting of these is at the fort of Vercovicium, now known as Housesteads. The remains of a fort on Hadrian’s Wall near Housesteads. Built in the 2nd century AD, it’s thought that the fort housed a double-sized infantry cohort and a large civil settlement. Archaeological excavation of the site has shown how water was collected and fed through the structure to supply the latrines, while it’s believed that local springs provided fresh drinking water for those who lived in the camp. The site is now under the care of English Heritage who, along with extensive conservation and preservation works to maintain the fort itself, have also installed a museum to explain what life would have been like for the military garrison and civilian residents of the fort during Roman times. You will find plenty of walking holidays that allow you to walk from one end of the Wall to the other, with stops along the way. As a huge attraction, every village that lies somewhere near where the Wall passes has hostels, B&Bs and guest houses to take in footsore walkers at the end of a day’s trek. On a relatively leisurely day’s walk, you could expect to take in 20 kilometres of the wall, making it a perfect week-long expedition for keen hikers or ramblers. Some of the stretch is particularly hilly and the weather can turn quickly from sun to rain or fog, so it’s always advisable to go prepared for any weather. Recommended for walking during the summer months only due to the highly fragile nature of its structure, Hadrian’s Wall has something for walkers and history buffs alike. Whether you chose to walk the full length or take in anything in between, you’ll find plenty to enjoy from this Roman relic. If Hadrian’s Wall isn’t enough for you and you want a list of things to do in North East England checkout the “Green Day Out” website.